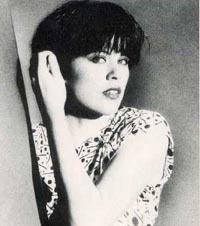 Her first LP was a 10 inch record, with songs that she had recorded on a Revox. The LP is called Sound on sound , because that is how she made it. She plays all the instruments herself and many are toy instruments. 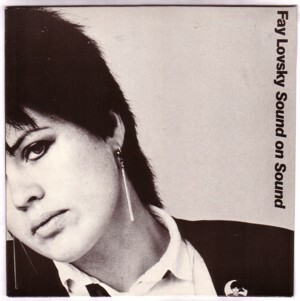 In those days (80’s) she named herself Fay Lovesick, but today she is known as Fay Lovski. Here is a song from Sound on sound . For mysterious reasons she Fay Lovski not world famous. After a handful of minor hits (including the beautiful Christmas was a friend of mine , which is one of the best Christmas songs that I ever heard), she began participating in all kind of musical projects that never made it on CD. As far is possible I try to follow her career, but she doesn’t make it easy for her fans. Fay plays many exotic instruments, among which are the saw and the theremin . I tried to find a tape with some of her saw music, that I recorded from the radio, but I could not find it. Don’t worry, I have plans to continue this blog for the rest of my life, so it will show up in the future. 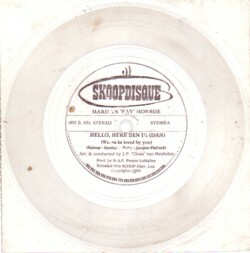 I did find a flexi record that she was released in 1984 as a promotion for a Dutch movie magazine, Skoop. On the transparent plastic record she is named Marilyn “Fay” Monroe, but not only are there no other Fay’s singing in Holland, her voice is easy to recognise. The record is pretty rare and my copy seems to have been used as a placemat by the previous owner, but hey, you should feel lucky to hear this! Marilyn ‘Fay’ Monroe sings how she had to leave the States after she got her life in a mess in 1962, and that she faked her death and moved to Holland, where she lives happy ever after, oopoopeedoo. I am well aware that information like this does no justice to Fay Lovski and her music, but there is not much more I can do. Many of her LP’s and 45’s are not difficult to buy, by the way; in Dutch second hand record stores you can get them for the price of a hamburger.